August sees the continuation of summer activities: outdoor sports, festivals, musical events, and the city-wide recycling that occurs with numerous garage sales. It’s also a time when it becomes necessary to have an extra layer of clothing handy, as some days can take a turn toward the chilly. This month there have been some evenings when I’ve played baseball dressed in shorts, others dressed in 3 layers, including wool. The midnight sun that reaches its peak in June cedes to darkness a little bit earlier each day, and sets around 9pm by the end of August. So there are no more 9pm baseball games; on cloudy evenings it can be hard to see the ball near the end of even a 7:30 game. However, what we lose in marvellous night-time sun we gain in dazzling night-time shows, as the aurora reappears in August. 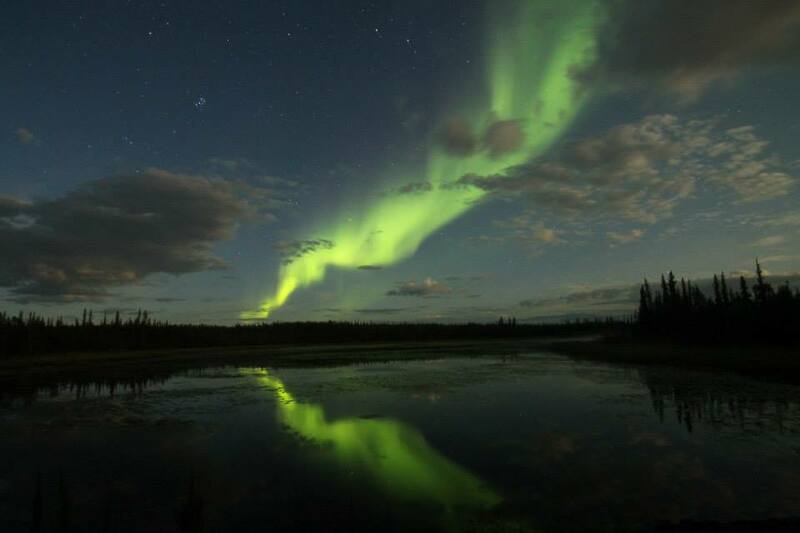 The summer aurora is different from that of winter, because the darkness doesn’t yet have the pitch-black quality of winter. So the sky can be painted aurora green with a tinge of sunset pink on the horizon at the same time. 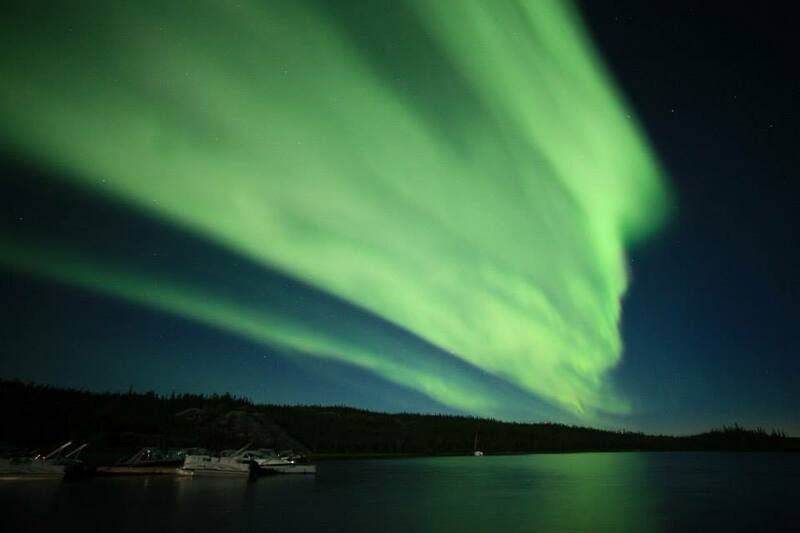 After a summer hiatus, aurora-viewing tours recommence in August, and it’s a good time of year to be a tourist in Yellowknife. 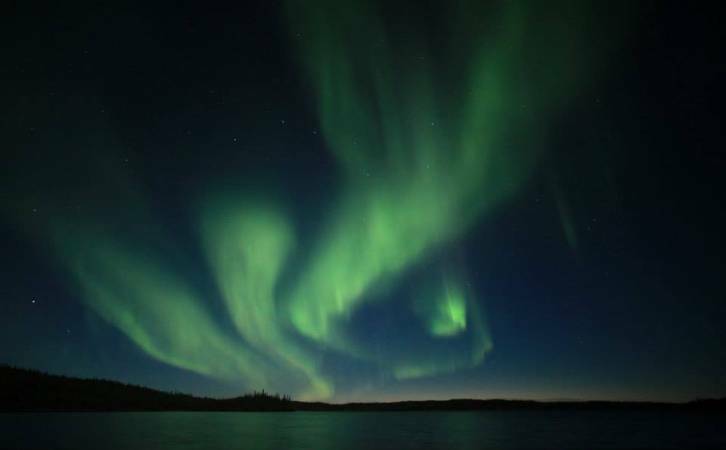 You can catch a big fish in the Great Slave Lake during the day, then take shots of the aurora at night, both without having to freeze your fingers off. These photos were taken earlier this month during an aurora-viewing tour with Northstar Adventures, who also happen to be the tour guide responsible for my first aurora-viewing. With the skies reminding us that summer is rolling to an end, we go about squeezing the most out of the season. 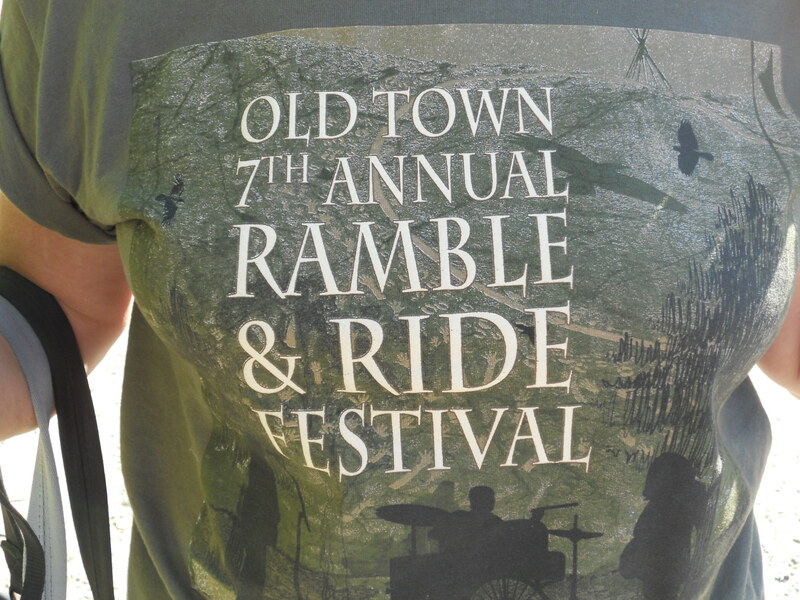 The Ramble & Ride festival takes place in Old Town over the August long weekend. 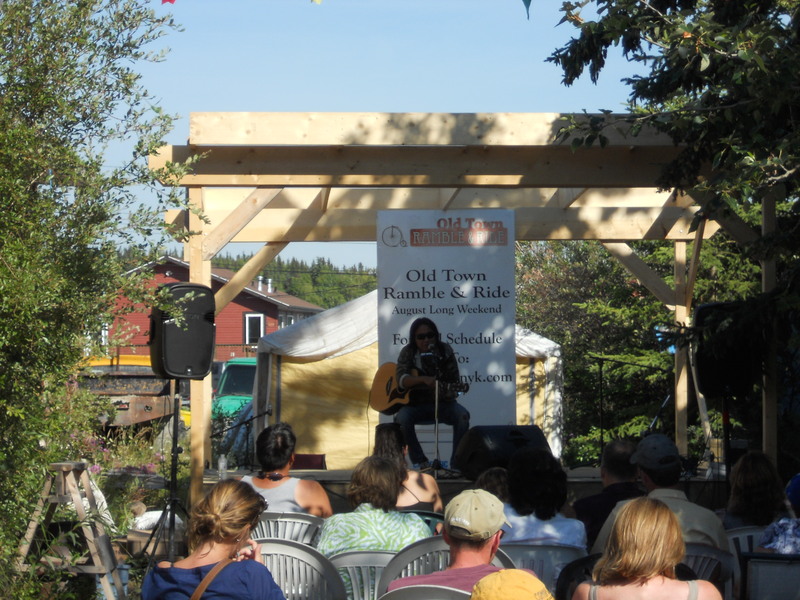 It’s a chance for the businesses of Old Town, as well as vendors from elsewhere, to show off their wares and offer some good ole Old Town hospitality. Yellowknifers are urged to leave their cars behind and ramble/walk or ride down the hill to Old Town, to check out the offerings and enjoy a weekend of fun events. This year, as usual, there was something for every taste: an arts market, food at assorted eateries, boat rides around Yellowknife Bay, musicians performing at various locations, demonstrations of traditional beading, (a fine art, in every sense) and caribou hair tufting. For the kids there was story-telling, face-painting, a puppet theatre, bouncy castle and a reading tepee. For those who didn’t feel like walking, there was even a rickshaw to provide rides up and down the main street. 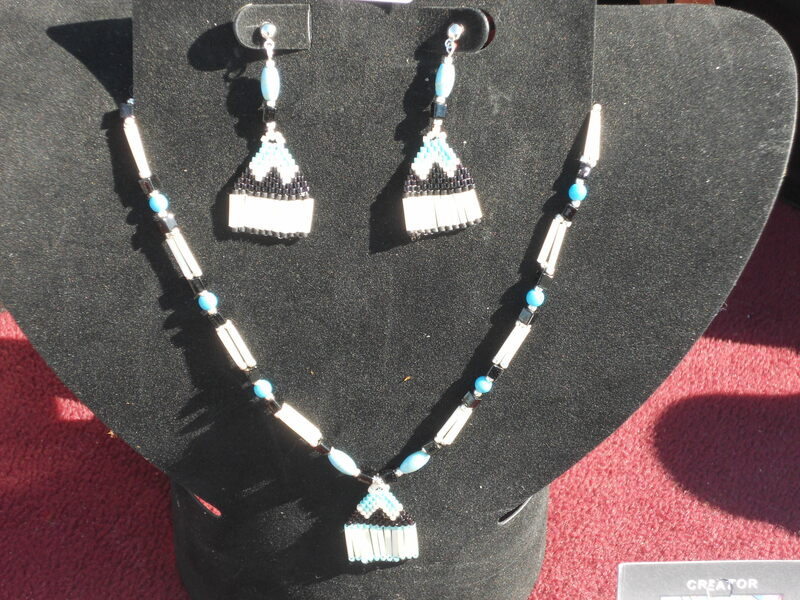 Among the items offered for sale by vendors lining the roadside for the arts market, I discovered some traditional jewellery made of various natural materials, such as deerskin and porcupine quills. I also learned that porcupine quills are hollow. I confess that I never gave it much thought before. The tip may be nasty, but the rest of it is very popular in native decorative sewing, and if you throw a few beads in, you can create some lightweight jewellery. Before I left, I had to take in some music, and I managed to catch a performance by Digawolf, who sings in English and Dogrib. There were also some unusual activities, like dumpster painting, which was a nice way to beautify the area. Those who don’t want to throw unwanted possessions into nicely-painted dumpsters throw garage sales and sell them instead. On summer weekends there are garage sales all over town, and Yellowknifers take them very seriously, awakening early to drive around to hunt for bargains, from 7am. There’s even a section of the Friday newspaper listing all of the sales, with a map so you can plot your route. 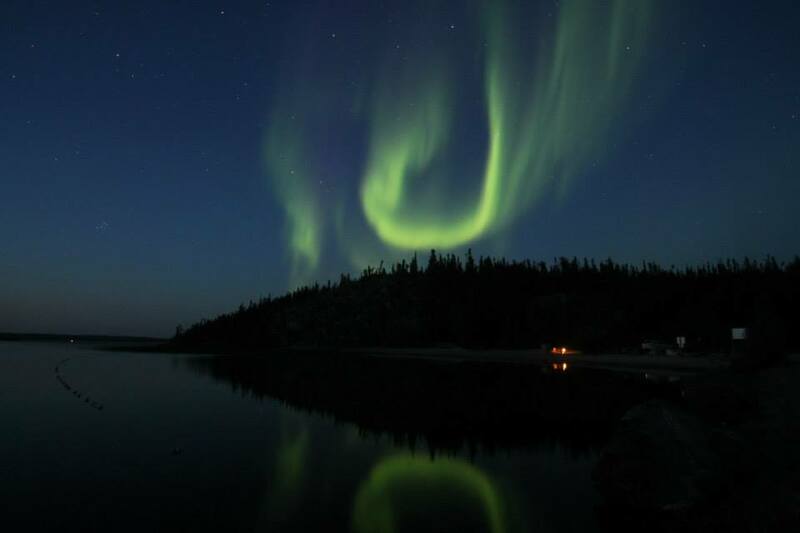 Yellowknifers are a mix of long-time residents, people here for a limited time,( e.g. on a military posting, or looking to gain work experience) and those who came with the intention of spending a year or two, but are still here some 5 or 25 years later because they ended up falling in love with the place. Yellowknife can have that effect on people. At any given time, there are always people leaving town, and it can be expensive to haul a houseful of stuff across the country. So during the summer months, it’s easy to lighten the load by emptying possessions onto the lawn and getting a few bucks for them in a garage sale. I’m willing to bet that there’s a rise in departures at the end of summer, because anybody who’s managed to get through the unforgiving Yellowknife winter deserves the reward of the superb summer, so they leave at the end of summer. Likewise, for those moving into town, they want to get here and settle in while it’s still warm, and if they’re planning to be transitory, they may not want to invest in new home furnishings. So it’s a perfect market set-up, with motivated buyers and sellers both. I swear that either the selection of couches in local stores is very limited, or the same couches are being bought and sold repeatedly. There’s a brown suede couch that I’ve seen in so many homes that I almost feel deprived because I don’t have one. Garage sales are usually over around noon or 1pm. At that time, whatever’s left is often taken to the officially-named Solid Waste Facility, fondly referred to by Yellowknifers as “the dump”. 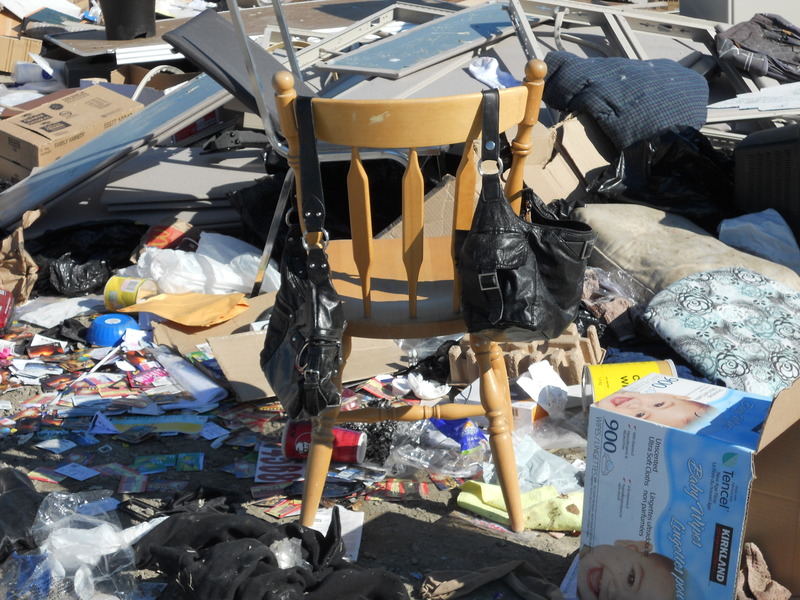 The dump is somewhat of an institution, because it’s a popular place for residents to go to find hidden treasures. As the saying goes: one man’s garbage is another man’s gold. 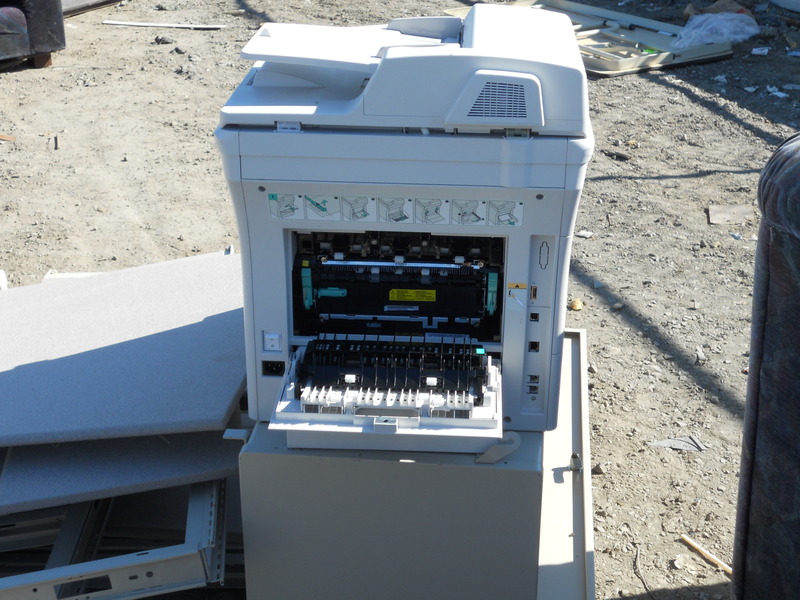 So those who don’t want to pay even the low garage sale prices go to the dump and pick over the remnants of garage sales, and whatever anybody else decided to deposit there. I’ve heard so much about this dump that I had to see it for myself, so I dropped in around 1:30 on a Saturday afternoon. It covers a huge area and in addition to the usual piles of tyres, flattened cars, fridges, stoves and washing machines, there’s an area set aside for household goods, where there were more people picking through stuff than dropping it off. I suspect that the best of the new stuff might have been picked up before I arrived. A pair of men were there with a moving truck and they hauled off a mattress set, a crib and a couple pieces of furniture. 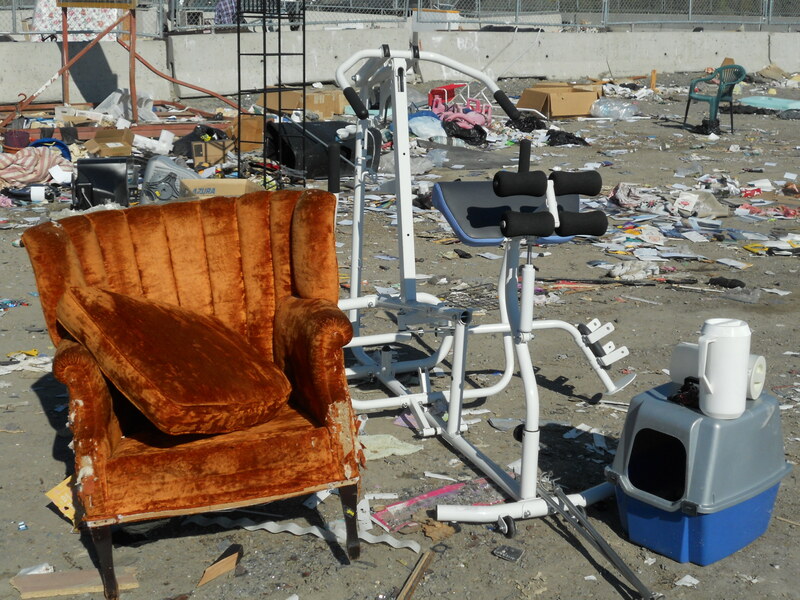 If you’re looking for a lamp, a couch (and you’re not fussy about having cushions), exercise equipment, shelving, perfectly good wine glasses, a handbag, TV, printer, or even clothing, you can find it at the dump. Some cities pay oodles of money to haul garbage to distant landfills and forget about it. 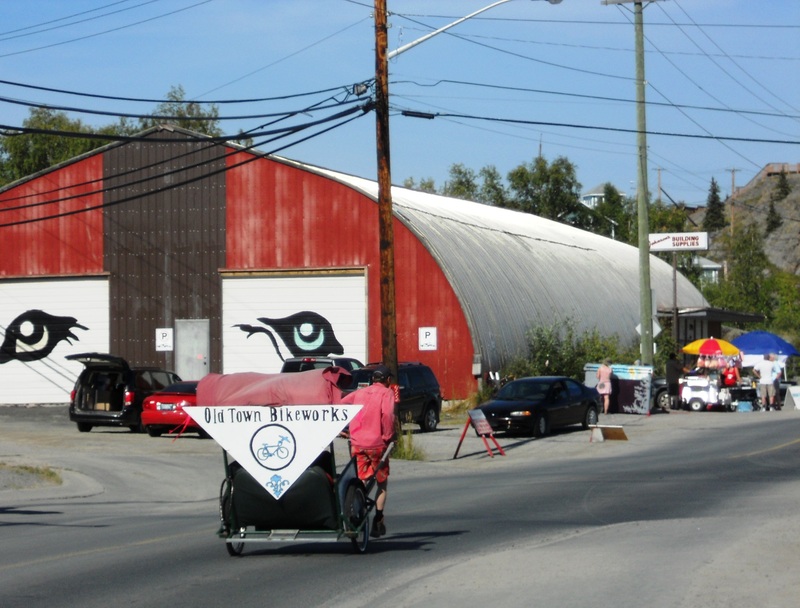 But with Yellowknife being in the middle of nowhere, with limited shopping, a dump with help-yourself recycling reduces handling costs and can provide some bargains to residents. As with so many things northern, it’s very practical and simply sensible. 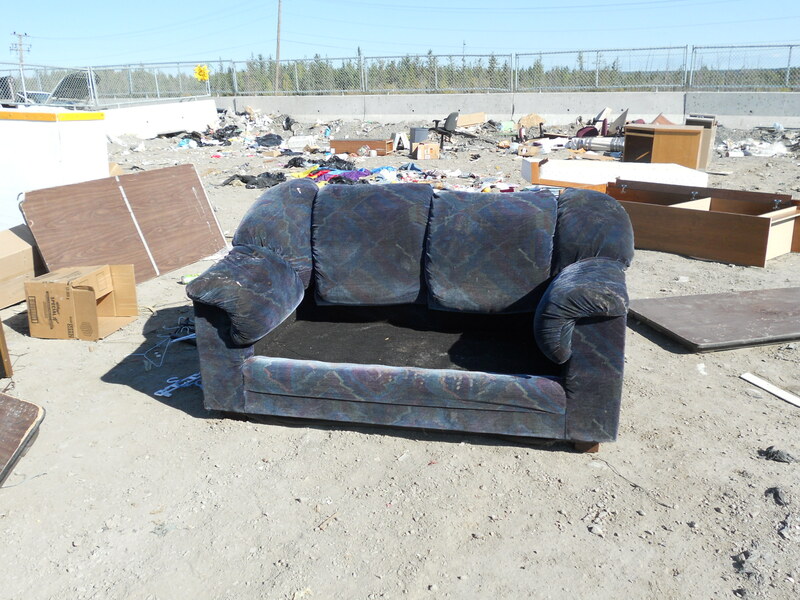 The only thing that I didn’t see at the dump was that ubiquitous brown suede couch. P.S. My parents are from Guyana! Small world! Glad that you enjoyed the blog. There’s a touch of adventure in driving across the country, as there is to living in The Knife. I encourage you to give that job some thought. As unimaginable as it may seem when you live in the GTA, it is possible to leave work at 5, be home by 5:10 and have a life. Snow will be on the ground to stay by Hallowe’en, so if you’re driving, you might have to think fast. 🙂 Best of luck to you! It’s completely amazing that you made the trip and wrote about it. I enjoyed reading about your travels – and ended up reading almost all of your other entries! Hope all is well. Great post as usual. Liked the couch story!